Flexible – Virtuemart Fancy Product Slider is updated today! 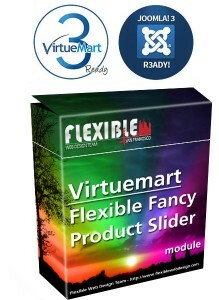 We are so proud to announce that; Flexible – Virtuemart Fancy Product Slider is updated today and now it is fully compatible with Virtuemart 3.0 and Joomla 3.x. Infinite loop. So the slider doesn’t stop when it comes to end, it rolls back to begining. 6 different LEFT-RIGHT choosable options. Choose which ever fits your website the most.